In this post, we’ll show you the different types of HTTP status code. HTTP response status codes indicate whether a specific HTTP request has been successfully completed. Responses are grouped in five classes: informational responses, successful responses, redirects, client errors, and servers errors. Status codes are defined by section 10 of RFC 2616. This code is sent in response to an Upgrade request header by the client, and indicates the protocol the server is switching too. The request has succeeded and a new resource has been created as a result of it. This is typically the response sent after a PUT request. This response code means returned meta-information set is not exact set as available from the origin server, but collected from a local or a third party copy. Except this condition, 200 OK response should be preferred instead of this response. This response code is sent after accomplishing request to tell user agent reset document view which sent this request. The request has more than one possible responses. User-agent or user should choose one of them. There is no standardized way to choose one of the responses. This response code means that URI of requested resource has been changed. Probably, new URI would be given in the response. This response code means that URI of requested resource has been changed temporarily. New changes in the URI might be made in the future. Therefore, this same URI should be used by the client in future requests. Server sent this response to directing client to get requested resource to another URI with an GET request. This is used for caching purposes. It is telling to client that response has not been modified. So, client can continue to use same cached version of response. Was defined in a previous version of the HTTP specification to indicate that a requested response must be accessed by a proxy. It has been deprecated due to security concerns regarding in-band configuration of a proxy. Server sent this response to directing client to get requested resource to another URI with same method that used prior request. This has the same semantic than the 302 Found HTTP response code, with the exception that the user agent must not change the HTTP method used: if a POST was used in the first request, a POST must be used in the second request. The client does not have access rights to the content, i.e. they are unauthorized, so server is rejecting to give proper response. 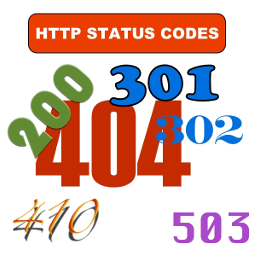 Unlike 401, the client’s identity is known to the server. The server can not find requested resource. In the browser, this means the URL is not recognized. In an API, this can also mean that the endpoint is valid but the resource itself does not exist. Servers may also send this response instead of 403 to hide the existence of a resource from an unauthorized client. This response code is probably the most famous one due to its frequent occurrence on the web. This response is sent when the web server, after performing server-driven content negotiation, doesn’t find any content following the criteria given by the user agent. This response is sent on an idle connection by some servers, even without any previous request by the client. It means that the server would like to shut down this unused connection. This response is used much more since some browsers, like Chrome, Firefox 27+, or IE9, use HTTP pre-connection mechanisms to speed up surfing. Also note that some servers merely shut down the connection without sending this message. This response would be sent when the requested content has been permanently deleted from server, with no forwarding address. Clients are expected to remove their caches and links to the resource. The HTTP specification intends this status code to be used for “limited-time, promotional services”. APIs should not feel compelled to indicate resources that have been deleted with this status code. Request entity is larger than limits defined by server; the server might close the connection or return an Retry-After header field. This response code means the expectation indicated by the Expect request header field can’t be met by the server. The server refuses the attempt to brew coffee with a teapot. The request failed due to failure of a previous request. The user requests an illegal resource, such as a web page censored by a government. This error response means that the server, while working as a gateway to get a response needed to handle the request, got an invalid response. The server is not ready to handle the request. Common causes are a server that is down for maintenance or that is overloaded. Note that together with this response, a user-friendly page explaining the problem should be sent. This responses should be used for temporary conditions and the Retry-After: HTTP header should, if possible, contain the estimated time before the recovery of the service. The webmaster must also take care about the caching-related headers that are sent along with this response, as these temporary condition responses should usually not be cached. The server has an internal configuration error: the chosen variant resource is configured to engage in transparent content negotiation itself, and is therefore not a proper end point in the negotiation process.